Fonds de Quarreux is the name of this part of the Amblève river. A legend tells about Hubert Chefneux, the miller of the Fonds de Quarreux who sold his soul to the Devil to get the wonderful mill he was dreaming about. But his wife who was worrying about that and wanted to save his soul hid in the mill with in her hands a medal of Notre-Dame de Dieupart. The mill wheels didn’t start turning! The Devil who was very angry destroyed the mill. Blocks of stones sloped down the mountain and fell in the Amblève. This would explain the presence of the big hard stones in the river. Park your car at N 50° 27.016’ E 005° 44.355’. Follow the signs to the Fond de Quarreux. There is a sign marking a walking path. It shows a red symbol and a number with two DIFFERENT digits. These digits are = ab. The underpass is not very high. The height of the cars that may pass here must not be greater than c.de meters. There leads a concrete way to the cache, but it seems to be difficult to push a stroller on this trail. The cache is hidden above the high water level, at N 50° 27. (c,a+b,e)’ E 005° 44.(a+c,a,b-a)’. The cache box is a small one, but no micro. So bring small trade items only. Vorig jaar deze al geprobeerd en niet goed gelezen en nu ging het wel goed. Mooie wandeling en snel gevonden. Of heb over de TB heen gekeken of hij is er niet meer ??? 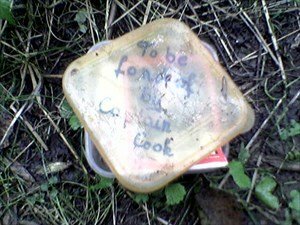 Second Cook cache today. Again a nice walk along a river. When writnig the log another person arrived and we met Speerpunt [8D] whom we had seen before at the Rocks of Mr. C. We had some talks and returned to the parking together. Another two entries into the log and a new one is needed! Our No. 100, good quality caching served by our captain!